Consuming and enjoying food is one of the few universal commonalities among the human population, but once you get any deeper than that -- flavors, textures, nutrition -- everyone's tastes can veer in many different directions. Burnt, the new drama from ER and August: Osage County director John Wells, concerns itself only with the upper-upper echelon of culinary flavor profiles, centered on a renowned chef whose egotism leads him to care less about people actually enjoying their food and more about the world basking in the greatness of his skill. It's a significant hurdle to cross in a story about the artistry of sustenance while the camerawork zooms in on dainty mushrooms, sparse greens, and colorful globs of who-knows-what, where the details of this food being cooked are markedly less important than the self-importance of their creator. Another pompous, edgy character from Bradley Cooper blends with mostly predictable career resurrection theatrics here, serving up palatable dramatic confections without enough substance to make them satisfying. Through some customary narration, Cooper's voice directs our attention to chef Adam Jones, whose prominence in his name-making Parisian restaurant came crashing down due to his drug and alcohol abuse. After fleeing the country and living out a self-mandated suspension for several years, largely out of guilt for the damage he caused to both the restaurant and to his coworkers, Jones travels to London to restore his name by dropping in on old contacts and informing them of his mission: to earn a third Michelin Star in their dining guide at a new restaurant, a rare feat. 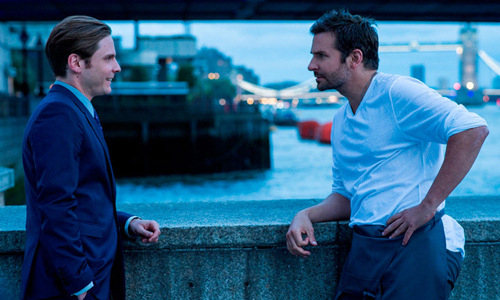 After getting back in touch with coworkers -- notably Tony (Daniel Bruhl), the host at his French restaurant and now the manager of his family's hotel -- and hunting down new, relatively cheap talent across the city of London, Jones' plan to formulate a new upscale eatery begins to take shape. His overly strict demands for perfection from his staff and his general coldness to people run the risk of ruining his second chance, though, necessary as they may be. 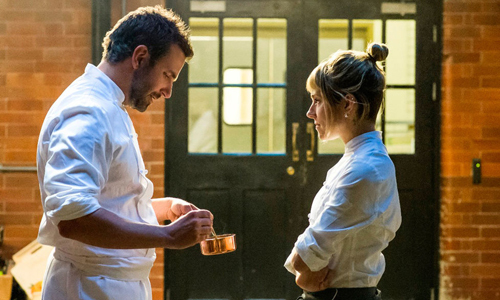 Jones receives the label of being an "arrogant prick" early on in Burnt, to which someone familiar with the rock-star chef retorts: "Yeah, he's a chef". That's essentially the scope of what's conveyed about the forgiven narcissistic nature of this antiheroic protagonist, whose condescension and hostility come across as an amplified version of someone like Gordon Ramsay from Hell's Kitchen: vulgar, abusive, and needlessly destructive in his kitchen, like a military drill instructor going too far. It'd be one thing if those were the attributes on the surface of a chef with a true passion for cuisine, but Jones rarely displays any admiration for the craft itself, seeming like he's only interested in obtaining the prestige afforded to him by his perfection -- even though he really couldn't get to where he's at today without some of that love. Intentional or not, Jones' story suffers as a character drama because of his unpleasant demeanor, generating displays of rage without the depth that'd give meaning to the dishes he prepares. It doesn't help that Burnt heavily relies on the acclaim already earned by Adam Jones during his self-destructive pursuits in France, making it seem like they weren't all that destructive to his career in the first place. From wooing past critics (a Brit-accented cameo from Uma Thurman) to obtaining the crucial funding for his new restaurant (with the stipulation that he passes blood tests and sees a therapist, warmly played by Emma Thompson), the lack of actual resistance that Jones encounters while getting himself reestablished in London sends a frustrating message about his pursuits and approach to the industry. In a word, he's empowered -- overpowered -- to a point that nearly makes him into the magical deity he thinks himself to be, able to seduce lesbians and force prospective employees to admit that they'd actually pay money just to work for him. Considering the roguishly insufferable and charmless manner that Bradley Cooper competently embodies as Adam Jones, this persuasion rings false. Ah, but that's all part of what's to be expected out of Burnt: this emphasis on a hardened and unyielding persona that'll eventually soften under the warmth of enlightenment about the importance of community instead of personal prestige. Amid beautifully-photographed shots of fine cuisine dropped in between curt nods and yells of "Yes, chef!" among the staff, director Wells underscores the pressure and rigors of that trajectory toward perfecting their kitchen, while being evasive about how, exactly, Jones' experiences there shape him into a different individual than the plate-tossing whirling dervish we grow to know. The moments when Burnt actually does strike genuine emotional chords -- a scene involving an unexpected request for a birthday cake, for instance -- rely on calculated Hollywood sentiment that doesn't extend naturally from the chef's established demeanor, especially when it comes to the barbed quasi-romantic interactions with a dedicated single-mother cook, Helene (an acute and likable Sienna Miller), and how she absorbs the lessons he has to offer. The meltdowns, the escalations in tension, and the progression of time towards the restaurant's crucial Michelin evaluation rarely stray from the formula, and Burnt lacks the conviction to experiment even when it almost shakes things up surrounding expectations of what's to come. By that point, it's difficult to choose whether to root for Adam Jones to reap the rewards of his determination or suffer the consequence of his negative karma and belligerence, largely because it's uncertain whether he'd appreciate anything other than that extra star to his name. His staff, his boss, and the people who rely on him -- including his culinary nemesis, Reece (Matthew Rhys) -- are what present a strong-enough argument for the restaurant itself to succeed, adding the necessary emotional component to the culmination of his efforts. Pulling for the chef to come out on top, to celebrate the fruit of his labors from such a young age and his dedication to staying clean while fully getting his career back on track, would've made for a far more nourishing final course, though.